We’ve created this infographic to help you compare the condo market in JP to Roslindale throughout the year. Let us know what you think. Somerville inventory was down 3.5% compared to August of last year. The number of condos that went “Under Agreement” remained in positive territory up 13%. Condo sales month to date were unchanged. Whereas sales year to date showed a negative 19% below August of last year. 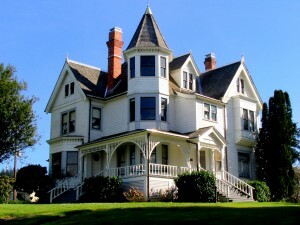 The average sales price increased by 10% to $516,018. The average sold square foot price went up $32 to $477 per square foot with an average unit size of 1,221 square feet. By Paul Turcotte – Reports on other towns or property type and price ranges available on request. Cambridge condo inventory continues to frustrate buyers and their agents being down 32% from a year ago. Now for some acceptable news, the number of condominiums that went “Under Agreement” was only 4% below the end of July 2014. Condominiums sold last month were 11% less with year to date sales down 7%. The average sale price remained stable at $745,246. The average sold square foot price was up $24 to $675 per square foot with an average unit size of 1,129 square feet. 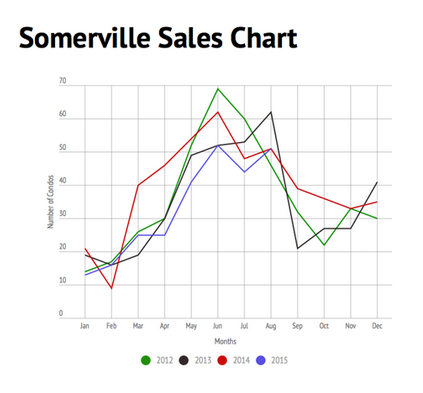 Somerville inventory was down 16% compared to July of last year. The number of condos that went “Under Agreement” was in positive territory up 14%. Condo sales month to date still ran a negative 8% with sales year to date coming in at 23% below the same time last year. The average sales price declined from $604,000 in June to $582,249. The average sold square foot price went up slightly to $500 per square foot with an average unit size was 1,195 square feet. Cambridge condo inventory continues to frustrate buyers and their agents being down 37% from a year ago. The number of condominiums that went “under agreement” improved although remaining off by 6% from the end of June 2014. Condominiums sold in June were 2.5% off with year to date sales remaining down by 8%. The average sale price continued to rise in June to $743 from $701 in May. The average sold square foot price was $651 per square foot with an average unit size of 1,161 square feet. 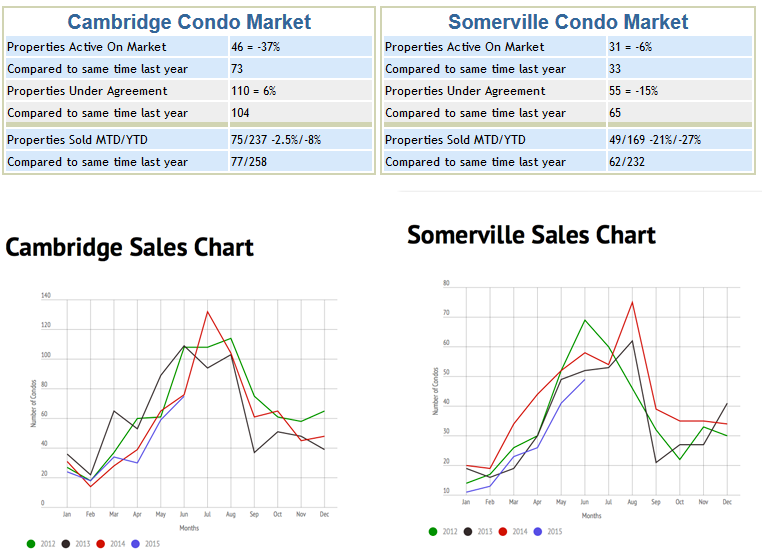 Somerville inventory was down slightly by 6% or 2 units compared to June of last year. The number of condos going “under agreement” was down 15%, a considerable drop from the previous month. Condo sales month to date ran a negative 21% with sales year to date coming in at 27% below the same time last year. The average sales price declined from $656,000 in May to $604,000 in June. The average sold square foot price remained the same month over month at $483 per square foot. The average unit size was 1,302 square feet.